Ten Books I Read at the Beach [Top Ten Tuesday] – my books. my life. Harry Potter and the Deathly Hallows (Yes, the first time through. Couldn’t pass up a beach day with friends just because it was the day after the release). What about you? Do you have beach-specific books? Or do you just grab whatever book you are reading like me? I’m just like you. I’ll read anything at the beach. The last time I popped over with the kids on a day trip, I read a murder mystery, and when I finished it, I read a weight loss book. Ha! Nothing like a little motivation when you’re sitting there hanging out of a suit. I love your list. There are some great ones in that stack. I love Persuasion. It’s my favorite Jane Austen. I’ve also seen every single movie and miniseries. It’s and addiction. I have read a lot of those books, and I have to agree that I don’t make special piles for when I happen to go to the beach. Though we live fairly close to the beach, we have only been a couple of times in the last year, and one of those times I was reading The Autobiography of Henry VIII by Margaret George. Not typically a beach book, but a great read nonetheless! I totally agree with We Have Always lived in the Castle…it’s so dark, one needs the beach sunshine for the contrast. I don’t really do beach reads either. Mainly because I prefer city holidays. A great list of books though. East of Eden is one of my favourites. Forgot to mention one more thing. I have read that Harry Potter too 🙂 I didn’t read it on the beach though – I sat at home and read it till late at night. I am like you…live so close to the beach that I don’t plan what to bring. I just grab what I am currently reading and away we go. Isn’t it great to live by the beach?!?! Have you read Sanditon by Jane Austen and “Another Lady?” It’s also a great read for summer. Also I keep seeing good things about the Bell Jar…but when I was younger I wasn’t allowed to read it. I want to now lol. My original comment disappeared so I’ll try again. I see you went to the ‘serious’ side for your beach reading. Great list. PERSUASION is my second favorite Austen book. I loved THE GLASS CASTLE but for me, this would be too harrowing for the beach. Also loved EAST OF EDEN and the Harry Potter books, especially the last three. I could definitely see myself reading Harry Potter on the beach. 🙂 And maybe even PERSUASION. But in general I do prefer something a bit less ‘deep’. Matched is on my list for summer reading. Thank you for all your ideas. 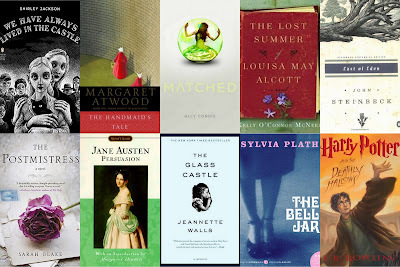 Here’s my list of books I plan to carry in my beach bag this summer. Awesome! I usually want to bring whatever book I’m reading at the moment, but if it’s something heavy then I’ll bring something lighter. For some reason I have a short attention span at the beach, so I need something light and quick that will also really hold my interest.